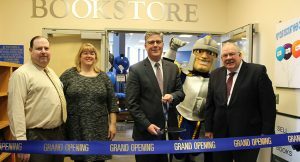 The Worcester State bookstore started a new chapter on Nov. 29 with a ribbon-cutting ceremony that marked its reopening after extensive renovations. Attending the ribbon cutting for the renovated WSU bookstore are (from left) Sean Cook, bookstore manager; Julie Kazarian, dean of students; President Maloney; and David Klein of Follett. 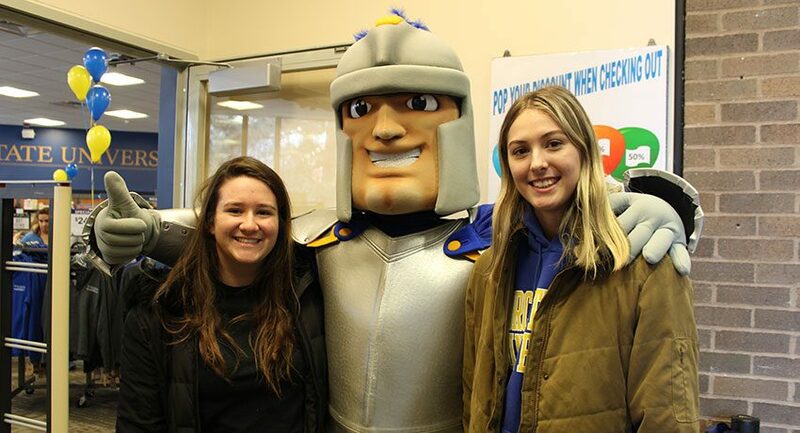 Pictured above: WSU students Sarah Deslauriers (left) and Anna Billings with WSU mascot Chandler at the ribbon cutting for the newly renovated campus bookstore.